Baby Socks. New Born Socks. When your baby starts to walk, they will need protection from the elements. Until then allowing your baby to have free movement of their little feet will better enable foot development. 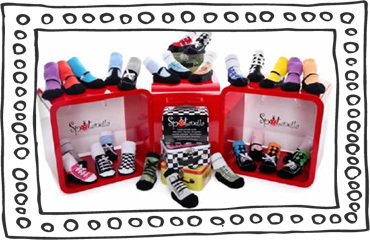 SPOTANELLA designs have the perfect solution to keeping feet warm, allowing the foot muscles freedom to develop, and making baby look oh so cute! Please send us an email should you wish to communicate with us. Subscribe to our newsletter to receive the latest specials and news.